Did you know Decorative concrete is environmentally friendly? An additional way value comes from decorative concrete is a bit unexpected. 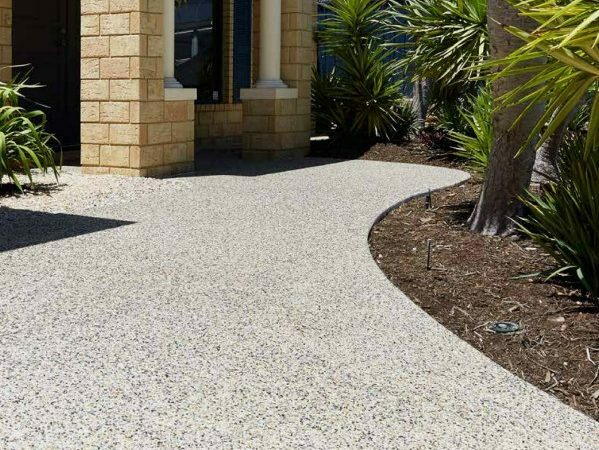 Despite the trend towards using sustainable materials and “going green” in our daily lives, many people do not realise that there are environmental benefits that come from using decorative concrete. The notion of concrete as a sustainable building material can seem counterintuitive at first glance. However, it qualifies as a sustainable material for several reasons. The primary material used to make concrete is limestone. This factors into sustainability because limestone is one of the most plentiful minerals on Earth. Other materials often used to create unique effects in decorative concrete are derived from byproducts of various manufacturing industries such as steel mills and power plants. Using these materials is an efficient way to dispose of waste without sending it to a landfill. This quality is particularly relevant for homes or businesses with concrete floors. By collecting and keeping heat, concrete makes it possible for property owners to reduce the amount of energy used for heating; at the same time lowering costs. Because concrete is a naturally porous material, it is highly useful in helping to manage stormwater. Other materials often used in paving tend to prevent water absorption. Blocking the water absorption leads to pooling and ponding of excess rainwater around paved areas, bringing among other things, erosion, a diminished water table, flash floods, and compromised water safety due to a risk of contamination. Conversely, when your beautiful concrete patio absorbs and retains rainwater, the water seeps gently back into the ground and refills the water table. Using decorative concrete in and around your home or business helps both your wallet and the environment in the long run. Because the concrete is sturdy, it will not need replacing for many years. You can get an estimated two or three times more wear time from concrete than from other frequently used products. Decorative concrete enhanced with non-toxic pigments and sealed with an odorless topcoat is now a favorite flooring option for health-conscious individuals as well as allergy sufferers. Carpet is one of the leading causes of allergy and asthma attacks because it holds dust, pet dander, dirt, and other allergens. Opting for decorative concrete floors removes a significant source of health problems from your home without sacrificing style. Concrete is a product that is customisable both in appearance and in quantity. Once professionals have calculated the necessary amount of concrete for your project, it will be mixed to order. Mixing concrete as needed helps reduce wasted materials. Additionally, if you should decide that your decorative concrete has outlived its usefulness, it is easy to recycle. Crushing and repurposing concrete is economical and straightforward; once ground, there are options for the new material. Among other things, it is useful as a part of a new aggregate, as filler, or as a first layer for roads. Helping to protect the environment while adding style and beauty to your home or business is a definite win-win situation.